This address would have been one to avoid. In Bram Stoker’s 1897 gothic novel, Dracula, the evil Count Dracula owns a mansion on Piccadilly, one of numerous homes he purchases in London. The address believed to be that of the mansion, based on information and architectural details given in the book, has apparently been identified – by people reportedly including Bernard Davies, co-founder of The Dracula Society, no less – as a property at number 138. After arriving in England – landing at Whitby, Dracula had first moved into a property called Carfax House located at Purfleet on the River Thames, just to the east of London. 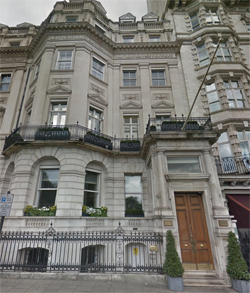 But after he was spotted in London, it is discovered that he has a property in Piccadilly (identified, though never named in the book, as 138). Those hunting him – including the unfortunate Jonathan Harker and vampire hunter Abraham Van Helsing – break in to the property with the intent of destroying some of the many boxes filled with earth Dracula brought to England with him from Transylvania (he needs them to keep alive). They do so and there find keys to numerous other properties in the city as well, dispatching two of their number to go and destroy any boxes they find there. They then wait in ambush for the Count at the “vile smelling” Piccadilly property but he manages to elude their attack and escape. Their chase then leads them to leave London and to pursue Dracula across Europe before he is finally defeated back at his home in Transylvania. The Grade II-listed, three storey property at 138 Piccadilly, located opposite Green Park, is now known as Eon House and is located next door to the Hard Rock Cafe. It originally dates from the late 18th century and was remodelled in the early 1890s – just before the book was written. The book, Dracula, is, of course, also associated with other London locations – including the London Zoo and Hampstead Heath. And Stoker himself lived in London for much of his life, spending 27 years as an acting manager and business manager at the Lyceum Theatre in the West End. An urn containing his ashes is at the Golders Green Crematorium.